Kony mobile solutions provides full omni-channel support for phone, tablet, responsive web and desktop native apps. Foresee the trends to harness mobile opportunities to beat the competition. Apps and enterprise application development platform offer enterprises the flexibility and efficiency for a wide range of device and OS compatibility. Using our ready to run applications, you can outline, design, build, integrate, deploy, and manage powerful apps at each and every step of your mobility experience to craft the industry’s most powerful open mobility platform. Create consumer-first app experiences using collaborative, cloud-centered app design and development. Find out a cohesive mobile infrastructure service that congregates MADP, MBaaS, and PaaS technology. The open platform for that connects all of your backend services. 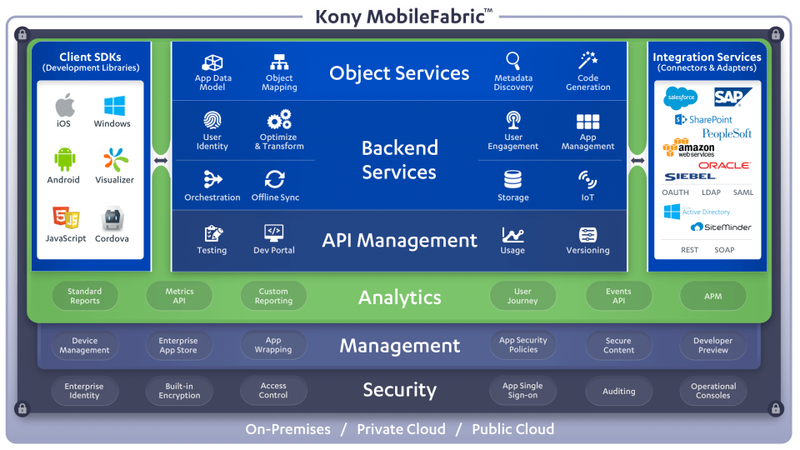 Kony Fabric is a set of enterprise-grade mobile infrastructure service that makes it easy to build amazing apps that supports and integrates all of your backend systems. AppVantage mobile apps are designed, built, tested, deployed, and managed by Kony in a highly interactive process with the customer. Managed mobile apps to deliver transformational mobile experiences. Get Managed Mobile Apps with Kony Mobile Solutions Today! Easy to deploy developed applications, which helps in reducing the time to market. Leverage a group of pre-configured features with ‘out of the box’ functionality premeditated with best practices.